Grounds are pretty. however I was paying peak season prices and ended up having to sleep on a portable bed that was VERY UNCOMFORTABLE because there were no rooms with two queen size beds. Also I was dismayed to find despite the peak season prices internet was not included. Nice hotel but needs a little updating in the room. coffee machine was not very good, and the bed and the furniture looked to be about 20 years old. I expected more from a JW. Beautiful hotel, everything you need is there in the hotel. I will be back! Very nice resort and off the strip. Very family oriented! The JW Marriott is a beautiful, well maintained resort with a friendly, helpful staff. Its location (Summerlin, ~1/2 hr from the the strip) isn't conducive to exploring the more famous casinos, but this resort offers a relaxed experience, far from the crowds. Free shuttles to the strip are offered but I didn't try them. Their casino is small, but nice. There's no poker room, but there is a good-sized sports book. Their cafe and buffet were OK, good values. Didn't get to try their higher-end restaurants. The pool is very nice... large, well designed, clean. The rooms are very large, well appointed, clean, and comfortable. Mine had a nice view of the mountains. Definitely much nicer than comparably priced rooms at hotels on the strip. If looking for a more "wild" experience, stay at a hotel on the strip. But for a more relaxed, comfortable vacation, with a little gambling mixed in, this is a great place. I'll definitely be back. Awesome pool, great staff. Watched the hockey game in the sports book, it was nice and huge TVs. Had a great time. Spacious elegant room, French doors and patio with a romantic view of a honeymoon esque garden. In room jacuzzi and double nozzle shower took me far away from a busy work week. Friendly attentive staff and restaurants, casinos, and bars within walking distance made this stay perfect. The valet parking and door staff were uncoperative in accommodating our situation when we checked in. Myself, my wife, and her elderly parents had 2 rooms and we needed a cart to bring in our own luggage due to sorting of luggage that we needed to due for her parents...they woukd not give us a luggage cart to do this and insisted we couldnt use a cart ourselves. Great property. Room was large and comfortable. Really nice jetted tub in room. The pool area was beautiful and a lot of fun. Had a great experience minus some of the food. Hawthorn grill was fantastic - definitely upgrade to include breakfast package! It was wonderful and would have been really expensive without the package. Great pool area. The other restaurants we tried were sub par. Wish there was more in the area or a shuttle to go the couple miles to take to shopping area/restaurants. There was a shuttle to the strip so that was nice. Great room and the gardens and walkways were gorgeous. Very pleasant stay! Traveling for business. I didn't get any shampoo in my room. Caked the front desk told they would bring it right up. 30 minutes later I walked down in my pajamas to get shampoo. Told that their supplier shorted them and they were completely out. They sent me to the gift shop to purchase shampoo. it would have been nice if they told me that over the phone instead of leaving me hanging and late for my appt. i loved entering the hotel and finding a beautiful and inviting lobby and not a casino. The hotel gounds made my moring walk a pleasant experience. I look forward to my return visit. I have family in Las Vegas and love to visit them. I always stay here. It's lovely and peaceful. Located in Summerlin, JW Marriott Las Vegas Resort & Spa is 1.5 mi (2.4 km) from Kellogg Zaher Sports Complex and within a 10-minute drive of Red Rock Canyon National Conservation Area. This 548-room, 4-star resort has a full-service spa, a casino, and 7 restaurants. There are multiple options for onsite dining with 7 restaurants, including Hawthorn Grill, which specializes in American cuisine. Order from room service to satisfy your hunger without leaving your room, or explore the resort and get a beverage at the bar/lounge or coffee shop/café. Buffet breakfast is offered for a fee each morning from 6 AM to 11 AM. A flat-screen TV comes with cable channels and pay movies, and guests can stay connected with WiFi and wired Internet. Beds sport premium bedding and the bathroom offers a hair dryer and free toiletries. Other standard amenities include a sitting area, a refrigerator, and a coffee maker. 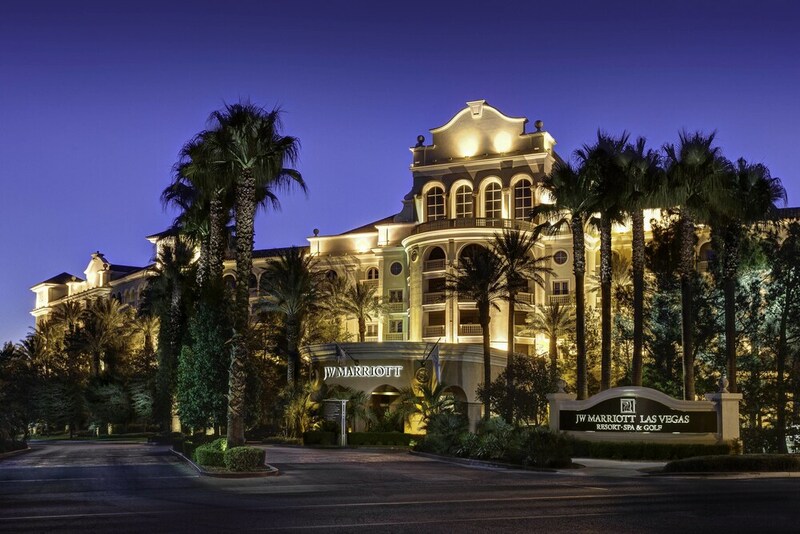 Guests of JW Marriott Las Vegas Resort & Spa have access to a full-service spa, a casino, and an outdoor pool. If you decide to drive, there's free valet parking. The front desk is staffed 24/7 to help with tours or tickets, securing valuables, and luggage storage. Other amenities at this spa resort include a health club, a spa tub, and a sauna. Hawthorn Grill - Restaurant and bar specializing in American cuisine. Open daily for breakfast, lunch, and dinner. Rampart Buffet - Restaurant specializing in international cuisine. Open daily for lunch and dinner. Spiedini Ristorante - Restaurant specializing in Italian cuisine. Open daily for dinner. Shizen Japanese Restauran - Restaurant specializing in Japanese cuisine. Open daily for dinner. Waterside Grille - Restaurant specializing in American cuisine. Open daily for lunch. The resort has an outdoor pool and a spa tub. A health club and a sauna are other recreation options.